Peerless-AV introduced its newest video wall mount, the SmartMount Supreme Full Service Video Wall Mount with Quick Release (DS-VW775-QR), at ISE 2018, Hall 12, Stand F90. Designed with the needs of integrators and end-users in mind, the DS-VW775-QR offers time-saving installation and maintenance features, including tool-less micro adjustment, easy hang wall plate, quick release mechanism, and reusable spacers for both portrait and landscape applications. With the addition of tool-less lateral micro-adjustment, the DS-VW775-QR offers 1.5" of fine tune adjustment on each of the X, Y, and Z axes. The mount also features prominently colored adjustment knobs that can be easily located by installers during set-up and future video wall maintenance visits. Plus, serviceability is easier than ever before with the press to release pop-out feature, providing quick and convenient access to a recessed display without searching for hidden pull strings. The gentle release mechanism requires less pressure to pop-out a display than other video wall mounts, giving peace of mind that the delicate pixel structure will not be damaged from pressing too hard on the display front. Reusable spacers can be used for both portrait and landscape applications resulting in a faster and more cost-effective install. Enhanced cable management allows the cables to effortlessly travel in and out with the display, eliminating the chance of interfering with the mount, as well. The standard version DS-VW775, launched in 2016, has the same feature set as the new DS-VW775-QR, but offers unique red pop-out levers above and below. When the mount is fully extended it offers an extra 2" of service space from the wall compared to the SmartMount Full-Service Video Wall Mount with Quick Release (DS-VW765-LQR/PQR). Both Supreme models weigh significantly less than previous Peerless-AV video wall mounts. 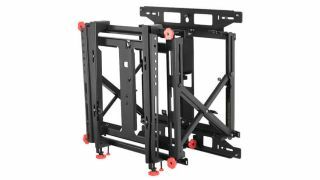 The DS-VW775-QR is 4.5lbs lighter and the DS-VW775 is 10lbs lighter than the DS-VW765-LQR Full-Service Video Wall Mount with Quick Release, for example. This makes these mounts even easier to handle and position, especially when combined with the installation app and reusable display-dedicated wall plate spacers. Using the easy hang keyhole adaptor plate, a single installer can simply hook the mount onto the wall, providing a hands-free environment to secure it – a valuable on-site time and cost saving feature.